A westbound Expo Line test train heads toward the Downtown Santa Monica Station at 4th and Colorado Avenue on Tuesday. Photos by Steve Hymon/Metro. The stretch of the Expo Line along the 10 freeway in Palms. An eastbound train crosses under the 405 freeway in West L.A.
An eastbound train crosses Overland Avenue. The new bike trail just west of Overland Avenue. A westbound train shortly after crossing Pico Boulevard. Expo test train on bridge over Pico. An eastbound train departing 26th/Bergamot Station. Another view east of 26th/Bergamot. A westbound train in the Northvale trench between the 10 freeway and Overland Ave. The Metro Board of Directors at today’s announcement. Photo by Juan Ocampo for Metro. The long wait for the Expo Line extension to Santa Monica is almost over. 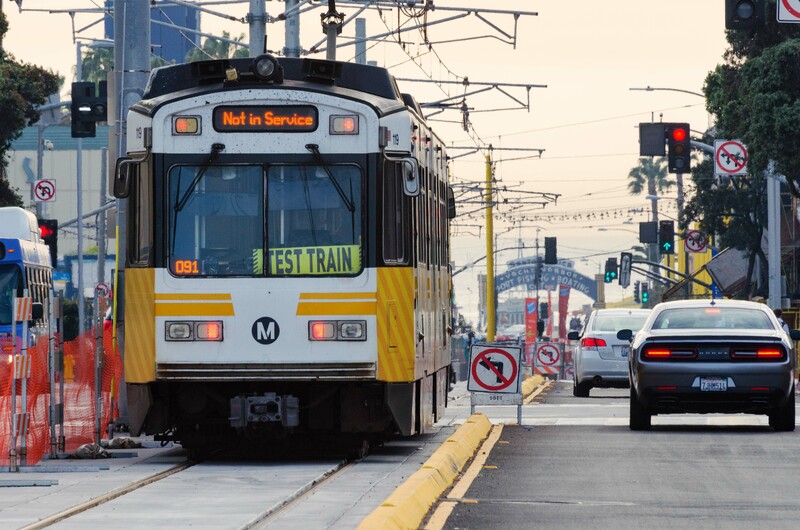 Metro CEO Phil Washington announced on Thursday that the 6.6-mile second phase of the Expo Line between Culver City and Santa Monica will officially open May 20. •This is the first rail transit to the far Westside since streetcars halted service in 1953. •The Expo Line will be a good alternative to the congested Santa Monica Freeway. The trip between 7th/Metro Center in downtown Los Angeles and the Downtown Santa Monica Station is expected to take 46 minutes. •Many of you voted to pay for this project, which was largely funded by the Measure R half-cent sales tax increase increase approved by Los Angeles County voters in 2008. This is the second rail project funded by Measure R — the first, the Gold Line Extension to Azusa, opens March 5. –Palms, an aerial station at the intersection of Palms Boulevard and National Avenue. –Westwood/Rancho Park, a street-level station on Westwood Boulevard, .3 miles south of Pico Boulevard and the Westside Pavilion. This is the best transfer point for buses headed up Westwood Blvd. to Westwood Village and UCLA. –Expo/Sepulveda, an aerial station on Sepulveda Boulevard, just south of Pico Boulevard. A number of offices, retailers and neighborhoods are nearby, including Sawtelle Japantown. –Expo/Bundy, an aerial station on Bundy just south of Olympic Boulevard. A variety of offices and retailers are nearby. The station is also about one- to 1.5 miles to the Santa Monica Airport and the neighboring business parks along Ocean Park Boulevard. –26th/Bergamot, a street level station adjacent to the Bergamot Station arts complex in Santa Monica and across Olympic Boulevard from the Water Garden office complex. Many other offices are nearby. –17th Street/SMC, a street level station at Colorado and 17th Street that is a .6-mile walk or bike ride to Santa Monica College. –Downtown Santa Monica, a street level station at Colorado and 4th that is steps away from the Santa Monica Pier, the beach, Santa Monica Place, the Third Street Promenade, the Palisades Park, Tongva Park and the Santa Monica Civic Center. •Trains will run every 12 minutes at most times of the day with service beginning about 4 a.m. on weekdays and ending around midnight. On Friday and Saturday nights, Metro Rail runs until 2 a.m.
•There will be parking available at three stations: Expo/Sepulveda (260 spaces), Expo/Bundy (250 spaces) and 17th Street/Santa Monica College (70 spaces). Metro staff have proposed a test parking fee program for these stations that still must be approved by the Metro Board of Directors. The fee would be $2 a day for those using Metro Rail. •A regular adult fare on Metro is $1.75 and includes two hours of free transfers. That means you will be able to travel between Santa Monica and destinations such as DTLA, Long Beach, Pasadena and Hollywood for a $1.75. Please see this page for more info on discounts for seniors, students, the disabled and Medicare recipients. There are also other transit subsidy programs for eligible low-income recipients. •There is a paved bike path along much of the Expo Line’s second phase — between Culver City and Palms and then between Overland Avenue and Colorado/17th Street in Santa Monica. The city of Los Angeles is working on finding the best route between Palms and Overland Avenue, where the train travels in a narrow trench. There is a bike lane on Exposition Boulevard on the first phase of the Expo Line west of Vermont Avenue. There is a paved bike path between La Cienega/Jefferson Station and Culver City Station. Here’s the Metro bike map. •Metro Rail will grow to 105 miles of routes with the addition of Expo 2 and the Gold Line to Azusa. Santa Monica will become the 17th city in Los Angeles County to have a Metro Rail station. Including the Gold Line extension to Azusa that opens March 5, the others are Arcadia, Azusa, Compton, Downey, Duarte, El Segundo, Hawthorne, Inglewood, Long Beach, Los Angeles, Lynwood, Monrovia, Norwalk, Redondo Beach, South Pasadena and Pasadena. A Pacific Electric streetcar crossing Motor Avenue in 1953. Photo by Alan Weeks, via the Metro Transportation Library’s Flickr page. •The Expo Line largely follows the old Exposition railroad right-of-way that was used by Pacific Electric streetcars and freight trains. The right-of-way was purchased from Southern Pacific in the early 1990s to preserve the corridor for possible future use as a rail line. •After plans to build the Red Line subway to the Westside went kaput in the 1990s due to funding shortfalls, Metro began seriously studying use the Expo Line corridor to get rail to the far Westside. •Construction of the Expo Line was done in two phases due to funding availability. The first segment broke ground in 2006 and opened to Culver City in 2012, the same year that heavy construction ramped up for Phase 2. •The passage of the Measure R half-cent sales tax increase in 2008 provided the funding to continue the Expo Line to Santa Monica. The project cost about $1.5 billion. Here’s the full set of Carter’s pics on our Flickr page. •The Crenshaw/LAX Line, scheduled for completion in 2019, will offer a rail connection at Expo/Crenshaw to destinations south, including the Crenshaw business district, Leimert Park, Inglewood, LAX and the Green Line. The Crenshaw/LAX Line will eventually include a station at Aviation/96th, where riders will be able to transfer to the automated train LAX is building to its terminals. The airport is saying their train project could potentially be done by 2023. 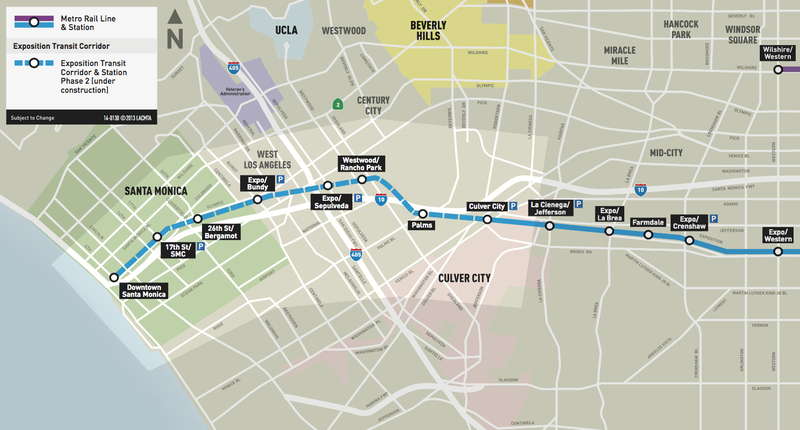 •The Regional Connector project will tie together the Blue, Expo and Gold Lines in downtown Los Angeles via a 1.9-mile underground tunnel. The Connector will allow Expo Line trains to run all the way to East Los Angeles while another set of trains runs between Azusa and Long Beach. Transfers between the Santa Monica-East L.A. and Azusa-Long Beach lines will be done at any of five light rail stations in downtown L.A. — Pico, 7th/Metro, 2nd/Hope, 2nd/Broadway or Little Tokyo/Arts District. •The Westside has more than 1.5 million people and is expected to add 300,000 more in the next 20 years. From the Expo 2 environmental study: “The number of jobs is also projected to increase by over 200,000. No significant expansion of existing freeway and street networks is planned to accommodate this growth. The enhancement of public transit provides an opportunity to move more people in a way that is more energy-efficient, and does not require the building of more freeways or widening of streets. How We Roll: how long does it take to drive from Santa Monica to Pasadena at rush hour? You also forgot that come May 20, our Metro Rail system will have reached a length of 106 miles, already making it larger than the Bay Area’s BART (104 miles) and Chicago CTA’s El system (103 miles). What is the deal with the paint job on the Expo trains? The new LRT paint scheme is supposed to be gray with yellow on the front. However, all of the newly painted Expo trains are gray, but still have the old orange stripe. You would think they would remove the orange stripe and add the yellow color to match the other other new trains. The new “sunburst” paint scheme will be used on all the new rail cars. Eventually the older rail cars will also be repainted to match. Great set of photos. What we now need is a set of before-and-after photos taken at the same locations. Once again, a great set of potos. Thanks. Palms station is not at Palms and Motor. It’s at Palms/National/Exposition. Damn, was hoping for early 2016 not mid. Hope I’m not to late to get a reply but I had a question about the trains that head to Santa Monica every 12 minutes. Will some trains turn back to dtla at culver city station? And if so will that be the same for the gold line? My understanding is that every train will run to Santa Monica. Like everything else in life, that could change — but I think there will be more than sufficient demand to run all the trains out to SaMo. why will it take 46 mins via metro to get to santa monica? its only 15 miles. For such a new track that seems quite long. People want speed and convenience. To go from 7th metro to north Hollywood is 13 miles and only takes 24 mins. That is the difference between heavy rail fully grade separated subway that can go 70 mph with no crossings and Expo which generally tops out at 35 mph and has to wait for numerous lights at grade crossings in Phase I. You are not taking account the mode here. The Red Line is a Heavy Rail/Subway transit train. Completely underground and has no interaction with any other modes of transportation. So this results in faster service. The Expo Line on the other hand, is a Light Rail Transit train that runs next to cars and even has to follow traffic signals with cars between 7th Metro and Expo Western. The “fast” section of this line is west of Expo/Western where the line is either Grade Separated or has the right of way when at-grade. Hence why the Expo Line is slower than the Red Line. Why will it take 45 minutes to get from 7th metro to santa monica on the metro? It is a stretrch of 15 miles. 7th and metro to north Hollywood is 13 miles and only 24 minutes and is a much older line. First, 7th/Metro to North Hollywood (Red Line) is heavy rail, while 7th/Metro to Santa Monica (Expo Line) is light rail. Light rail is inherently slower (http://metro-cincinnati.org/?p=1566), and building the Expo as a subway would have been prohibitively expensive (Metro and the city actually did consider it–see page 13 of http://media.metro.net/projects_studies/exposition/pdf/2005_feis/Chapter%202%20Alternatives%20Considered.pdf in particular alternative proposals #4, #5, and #6). Second, the first segment of the Expo Line (7th/Metro to Culver City) includes a considerable amount of at-grade rail, meaning the train gets stuck at traffic lights, etc. (even if it has priority). So the slow part of the ride is mostly in this first segment (8.7 miles in 29 minutes, average speed of 18 mph). The second segment, with a substantial portion of aerial track, will actually be faster (6.6 miles in 16 minutes, average speed of 25 mph). Third, the Red Line simply has fewer stops (9 stations between 7th/Metro and North Hollywood) than the Expo Line does (17 stations between 7th/Metro and Santa Monica), and it takes time to slow down, allow passengers to board/alight, close doors, and accelerate. Nah that’s a problem for Orange County not LA Metro! No way! We neanderthals in Orange County no like trains. We kill Center Line. We no like Santa Ana street car. We like highways! Metrolink to Anaheim ARTIC! From there there’s either a shuttle or a $5 Uber, it’s about a mile and a half away. Actually you would take Metrolink to Fullerton and transfer (for free) to the OCTA 543 or 43 bus to Disneyland. If you wanted to get off at ARTIC you would transfer (for free) to 14 or 15 ART Bus to Disneyland. I would LOVE to see a light rail line to Disneyland, the biggest problem with Metrolink its that its expensive and they don’t run trains frequently or early/late enough to make taking the train to Disneyland a viable option. Disneyland is in Orange County. Metro only builds rail in Los Angeles County. Orange County still to this day has 0 miles of rail transit. Los Angeles county will have 106 miles in 3 months. So the lack of rail to Disneyland isn’t Metro’s fault. I once read that the Gold Line might someday be extended to Ontario Airport, but that would be out of LA County. I know that in Chicago, the Purple Line L does to Linden Street Station, and the Yellow Line (the old”Skokie Swift”) goes to Dempster and may be extended to Old Orchard Road, both of which are outside the Chicago City Limits. I get confused with how jurisdiction works in these situations. It may be apocryphal, but I heard some story that Walt Disney offered to build a free monorail years ago but was turned down. Anyone know if that really happened? Will riders be permitted to bring bikes onto the train? What time will the grand opening be on May 20 in Santa Monica? Will there be a grand opening event at the stations? No details yet on the ceremony and when free rides begin. As soon as everything is official and nailed down, we’ll let everyone know! Good for us who work in Santa Monica currently I take the 733 and it takes like 1 hour to get there…I’m so happy.. I work in 4th. and Olympic… Perfect location for the last stop😄😃thanks. If it’s a licensed guide dog or in a crate or carrier. And “state of the art”?!? Hyperloop estimates are placed at $7 billion to cover 400 miles from LA to SF in 35 minutes. This 1970s technology gets you 15 miles in 46 minutes. Shame on everyone associated with this project. The Hyperloop will get you to SF in 35 minutes but it takes four hours for the cleanup crew to hose your remains off the walls. Very excited to hear the good news about the Expo line extension. I’ll check it out on day one. Mr. Sullivan, there isn’t even a working prototype for a hyperloop yet. Your $7 billion is imaginary. How much would it cost to construct elevated pylons between here and San Francisco? Al Jezeerea reports that “Michael Anderson, a professor of agricultural and resource economics at UC Berkeley, predicted that costs would amount to around US$100 billion.” They also report that the proposed system could only move 840 people per hour. If it really only cost 7 billion, that would still end up being $20 a ticket. It’s probably closer to $1,000 a ticket. That’s much less effective than the brand new Expo Line. Oh, and the Burj Khalifa is half a mile tall. You can fit thirteen of them on the new half of the Expo Line and still have room to spare. You’re missing another difference between the Expo Line and the Hyperloop…namely, the Expo Line actually exists right now. 🙂 This is Metro, they’re publicly operated and publicly funded. I’d imagine it would be exceedingly unpopular (possibly illegal? IANAL) if they started using funds earmarked for improving LA’s public transit system on investing in a transportation mode that has not yet had a successful prototype. That’s not to say that Hyperloop can’t or won’t exist, but I doubt you can expect exploratory work to be carried out by an agency held up to public scrutiny. If/when the day comes that Hyperloop is successfully designed, constructed, and operated over a long enough period of time by private investors to become a well-accepted transit mode, maybe Metro can give it some thought. I think we’re simply too early. Also, I was under the impression that Hyperloop was mostly being considered for long-haul routes, since the power of the technology is high top speed, no? Would it make sense to construct in an urban setting where there’s demand for stations typically less than a mile apart? I might be misunderstanding this, so please feel free to correct me. Yeah, a 200 story building to house offices for lawyers, a 5 star hotel, multimillion dollar condos is a much better investment than a mass transit system that is available to millions of people and helps bypass some of the worst traffic in the country. We should only spend money on projects that exclusively benefit the 1%. Hyperloop isn’t even science. It’s just theory. It needs to be proven in order to become science. Today’s light rail technology is proven, and there are known prices for everything. There are no price precedents for building a hyperloop, so anything concerning the cost is just optimistically hypothetical. And even if hyperloop is possible, it will be more feasible to use to transport goods than people. This is all good news, but isn’t this project over a year late??? Will there be a goldline to Montclair plaza anytime soon?? Great news to finally have an opening day! Although it does mean that I’ll have trouble finding a seat when I get on the train in Culver City for my morning commute to downtown. That’s the price I pay for progress. Go progress! 1) Will the peak period headway be 12 minutes (as it is now) or 6 minutes (as in the environmental documents)? I thought that the new order of Kinkisharyo cars would be enough to run at 6 minute headways. Are they waiting until that delivery is completed, or are they waiting until ridership is high enough to warrant more service? 2) What will the run time be on the schedules? The environmental documents say 46 minutes, but I’m skeptical that they can do better than 49 minutes considering that Phase 1 takes 29 or 30 minutes for the first 8.5 miles. 1) It’s probably a combination of both. I keep hearing there are delays on delivery of the new train cars and 2) Waiting for ridership to grow, which honestly, it’s a given. Even the Gold Line is running 12 min peak between Sierra Madre Villa and Azusa, though 6 min peak will continue between DTLA – East Pasadena. 2) I think it’s possible for it to go end-to-end in 50 min. The thing to remember is that, there aren’t as many stops west of Culver City and it will run Grade Saparated or have complete Priority until the final mile. Unlike the Flower at Section of this line. One thing I noticed about the Line now, is that it is fast until it hits USC, then it’s just a drag. Where is the closest parking for the downtown 7th/metro station? The closest parking is at the Expo/Crenshaw Station. Parking is available at West Angeles Church of God in Christ. There are 450 spaces available Monday thru Saturday. You could pay for parking at some of the lots near the Convention Center. Outside of convention days, it’s $5 or $6 a day, provided you can get to your car by 7 pm. This is all great. Now how about light rail service that follows the 405 from the Valley to LAX? This would have been a much better use of available funds…and a much more efficient way to move the citizens of this city…than it was to expand the lanes of the 405. They could have run it right down the center of the freeway as they did on the 210. In due time, my pretty. Valley to Downtown to LAX…Orange Line Busway will eventually be converted to light rail…and from there you can catch the Red Line Subway in North Hollyweird to the Blue Line to the Green Line to LAX. I can’t agree more. It would have improved the gridlock on 405 and air quality as well. How about Metro living up to its long-term commitment to multi-modal by giving us details on the bus/rail interface, which (based on my experience as a former Metro Service Councilmember) had to have been discussed and voted on long before now? A list of lines that will make route changes and/or extensions to the new stations, changes in span of service and frequency, and whether those changes will happen concurrent with the May 20 opening date or delayed to take effect with the rest of the semi-annual service changes in late June, would be more useful than the largely-PR piece posted here. I agree, although my recollection is that Metro is not doing anything until the shakeup. There really isn’t that much time to prepare for significant service changes separate from what is implemented in June anyway. In August 2014, there was a proposal to discontinue 534 service east of downtown Santa Monica would be discontinued. Other than that, there were only suggested targets for reallocation of resources once 534 service is scaled back. Haven’t seen anything about it recently. What the hell is Sawtelle Japantown? Ever heard of Little Osaka? Come on man! As much as it pains me to link to the LAT….http://lat.ms/24tG9ub. I actually thought it was officially Little Tokyo West. Opening just in time for summer and Memorial Day weekend. It will be interesting to see the ridership numbers for the Holiday weekend from the City to Santa Monica. The Pacific Electric Red car on the bridge is officer car 1299 preserved out at Orange Empire Railway Museum at Perris, Moreno Valley, Riverside County, CA. It is probably on a RR booster excursion in that view. Lack of parking at the Rancho Park and Palms stations was a mistake, and will reduce the usability of this resource for many commuters. A increase of 300,000 in population and 200,000 new jobs is just another reason to address the gridlock on both Santa Monica and Sunset Bl’s that will see little to no relief with the Expo Line extension. A line down the old P.E. right of way along Santa Monica Bl. would truly relieve hopefully the most extensive gridlock twice each day in the entire Los Angeles area.